SAM 2.0 | I do these things so you don't have to. I do these things so you don't have to. My sister sent me some photos of a couple of hedgehogs she and the kids saw tonight, near their house, and says I can use them here. I have never seen ‘my’ hedgehog early enough to get anything but the grainiest shots. He’s much larger, I’m assuming these are younger ones. My niece wanted to sing them a song and my nephew wanted to perform a dance for them. Disney has much for which to answer. They were told to be still and quiet, and mostly were. The hogs were apparently unfazed because they continued eating. They like the allotment and rhymes, and so I am the Plantiest Auntiest. I have plans to rope them in to make insect shelters from sunflower canes, but they’re still so young they aren’t hugely helpful. Some things just will not die. The other things which flourished under my absence, the sunflowers, have come into their own. Everybody else’s are past their best, but I planted mine so late that they’re looking glorious now. This is after today’s rain. If I met whomever invented the hand-tied bouquet, or the inventor of the collapsible vase, I’d snog them full on the mouths. Seriously, if you’re as rubbish as I always have been with flowers, whilst simultaneously really liking them, the hand-tied bouquet was a revelation. Everything looks good in a florist, but I can guarantee that it’s perfectly easy to transform that into something much less elegant in a matter of moments. Add the collapsible vase and you can just leave it alone, with little more than remembering to add more water. I’ve cried over flower arrangements. Daft, I know, but I have never ever been able to get it right – vase size wrong, proportions out or, often, not enough flowers to accomplish what I wanted. Not last night, though. Last night I managed to take a really very pretty bouquet I’d been given, and get it in a vase without ruining either in the process. I am recently re-immersing myself in music, after a break of several months, and since I’m starting to do stuff once more, it’s about time that I updated my anthology, which combines the two. Hozier’s lovely Take Me To Church is a recent discovery, heard at the end of an episode of The Leftovers. It’s the first thing I’d heard in ages that made me go looking for it before it’d even finished playing. It was one of the first few things I’d actually liked in months. I’m hooked, and if this doesn’t get me baking again then I don’t know what will. Work Song, as the name implies, lends itself perfectly to restoring order to a trashed kitchen. Especially good for scrubbing floors and you won’t care that it takes twice as long as it normally would. Speaking of which, I was recently reminded what a great song Roar is for scrubbing kitchen worktops. They’ve sparkled more brightly ever since. I found myself singing along to it the other week, much to my surprise. As a result, there will need to be more of that. (I might have just bought Katy Perry’s album, Prism, among other things.) This is How We Do is clearly an excellent one for all sorts of tasks, but has been fully tested and approved for use with making risotto, laundry-folding and ironing. Save Firework for the crappiest stuff you have to do. Just don’t play it while on a step ladder: that ceiling’s lower than you think. I should remember to play Aloe Blacc’s acoustic version of Wake Me Up when I wake up, but always forget because I’ve just woken up. Instead, Here Today makes a good one for getting through mountains of hand washing up without wishing for the sweet embrace of Death, which is quite the result, really. Cleaning under the sofa cushions wouldn’t be the same unless accompanied by I Need A Dollar. Bonus points for finding children or small animals, preferably your own. I went to the allotment and assisted (held things) while someone who knows about these things taught me how to make a rectangular or square raised bed. * The wooden slats I saved from my old bed have now come together to make something really lovely and sturdy. I can see I’m going to have to add a cordless drill and screwdriver to my Christmas list. I’d love to show you a picture but I got distracted by the sunflowers, which have picked up again now that they’re getting stuff like regular water and fewer things competing for the light. Look! This one’s finally caught up with the others. I didn’t mean to take this but I rather like it. The proper yellow ones are still my favourites. It helps that they’re not enormously tall. The green ones got taken out. Having planted 12 tomato plants this year in grow bags and ring culture pots around my garden, I’ve been picking a lot of tomatoes recently. 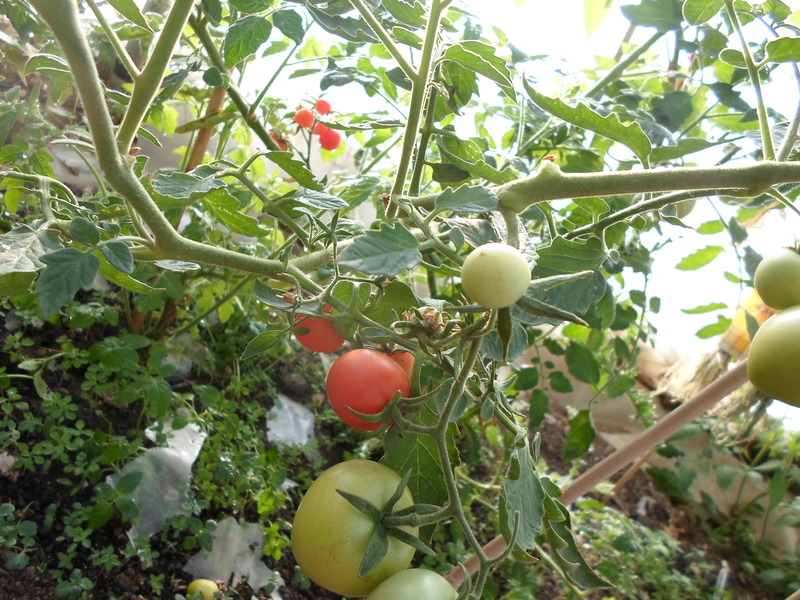 The two main varieties I’ve grown are Gardener’s Delight and Moneymaker. The former provides loads of large cherry tomatoes and the latter a decent sized larger tomato, both of which are delicious cooked or raw. 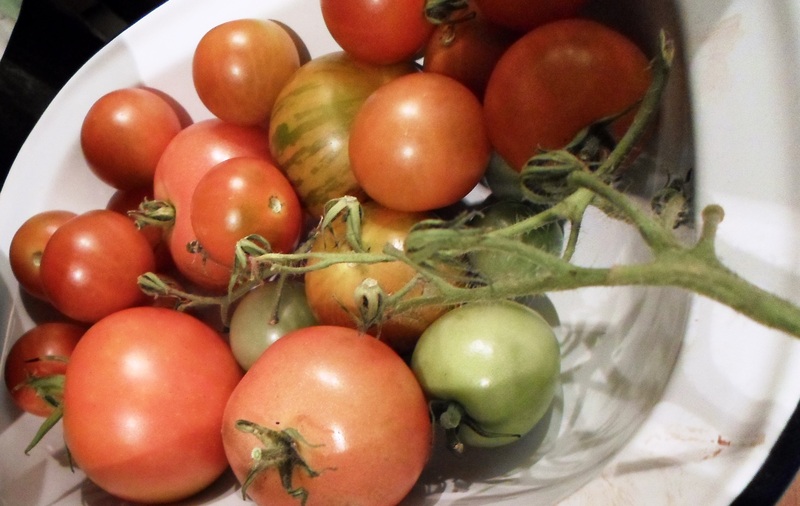 I’ve also got a couple of plants which produce lovely striped tomatoes, given to me by a friend. They’re better for cooking. I wanted to make a simple sauce base which could be used for a number of dishes. This one, from Delicious Magazine, can be blended with stock for a soup, or used in any number of ways with pasta and other stuff. Some options are given with the original recipe, making it a very versatile sauce for something so easy to make. It’s suitable for freezing and makes about 500ml of sauce. I’ve already defrosted a batch for a bolognese, to which I’ll add some red onion marmalade and some other bits, and see how that turns out. Preheat the oven to 190°C/fan 170°C/ gas 5. Cut the tomatoes in half and arrange them, cut side up, in a single layer, in as many roasting dishes as you need. 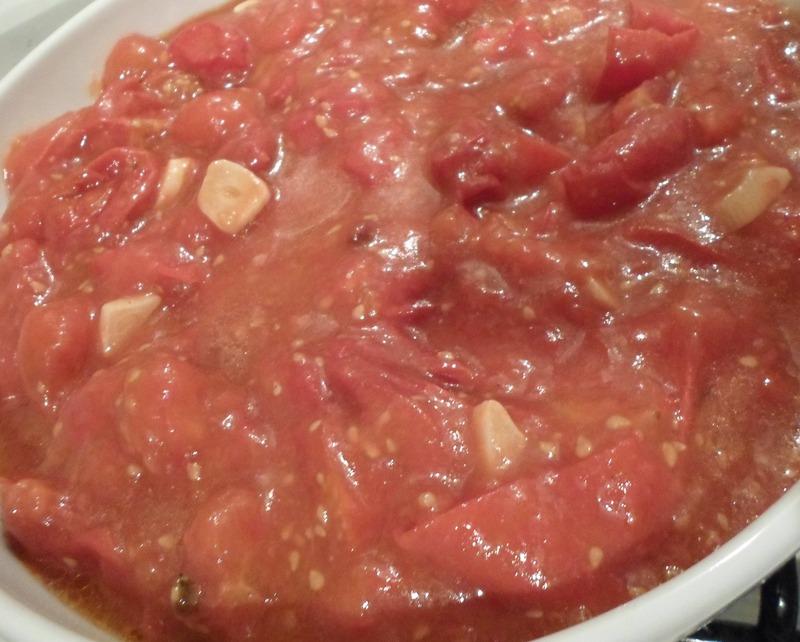 Push the bits of garlic right into the tomato flesh, where the juice will help soften it. Sprinkle with the sugar, salt and pepper and dot with the tomato purée. Drizzle the oil over the tomatoes and roast until soft, which takes about an hour. 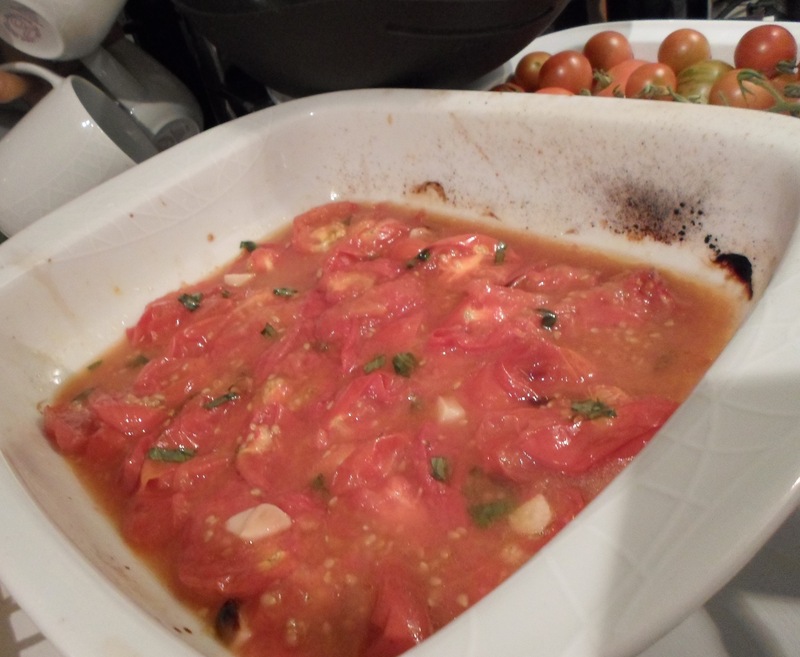 Once cooked, sprinkle over the torn basil leaves and crush them into the tomatoes with a fork to form a sauce. N.B. Remember cooked tomatoes will burst/potentially spray hot liquid in random directions if squished too hard. Cover arms, don’t stick your face over it to see what you’re doing. Fortunately, my kettle and toaster were the only casualties this time. Once cooled, you can blend the sauce as smooth as you like, which I prefer as I’m not a fan of all the skins and couldn’t be bothered to sieve them all out. The finished sauce keeps in the fridge for up to 4 days. The first batch of this was made to the letter of the recipe. When I made it the second time, I totally forgot to add the sugar or tomato purée. I roasted in batches and then combined everything before blending it. The overall flavour is delicious and not too acidic so I’m glad I omitted the sugar – I think it would have been overly sweet otherwise. The recipe says to use medium tomatoes but I used everything I had. The only thing I did was fill roasting dishes with all small or all larger tomatoes, to ensure they cooked evenly and adjusted my timings accordingly. I portioned the blended sauce into freezer bags, using mugs to keep them a uniform shape. I then froze them in the mugs and removed when solid. That way they fit into small gaps and I don’t have to commit to making any one dish, or end up with a freezer which is 75% soup. Turn the block out of the bag into a container, while still solid, and then defrost. Simples, as that annoying meerkat might say. 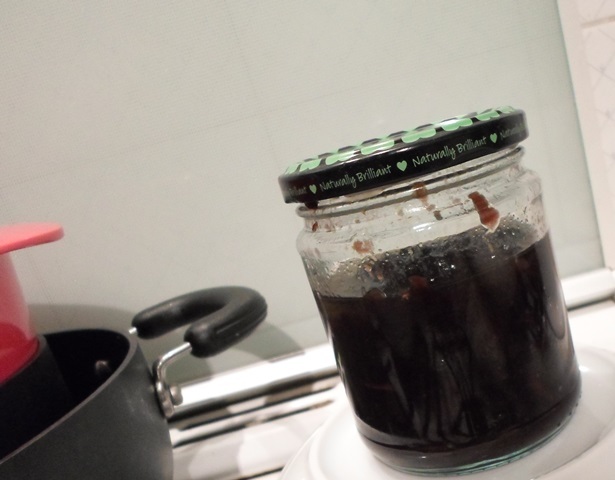 This time, I decided to try something different and went for a red onion marmalade recipe which uses an entire bottle of red wine and 200ml port, along with 140g butter and the same amount of sugar. It’s much richer than the previous one. Because I let this cool (don’t) before reheating, I tasted some before it went in the jars. It’s lovely: sweet and sticky, a lovely colour and would liven up even the most boring sandwich. It should also be good stirred into gravies and tomato sauces. My terrible photo and under-filled jar don’t do it justice. If you’ve got the time and inclination, I’d definitely suggest trying this. I’m going to order some smaller gift-style jars and hand some of them out around Christmas. The recipe says that it will take 2.25 hours to cook, plus cooling time. It actually took a lot longer. The recipe also says it’ll make around four 500ml jars but I got 2.25. Some of that will be down to cooking it for longer but I still think four would be ambitious. Halve and thinly slice the onions (which will take ages but is well worth the effort) and then thinly slice your garlic. Melt the butter in a large, heavy-based pan over a high heat. Add onions and give them a good stir to ensure they are well coated. Note: I used an enormous chef’s pan and it was initially very full. I found the easiest way to stir without chucking onion over the sides was to use a chopstick until it cooked down a little. Sprinkle over the sugar, thyme leaves, chilli flakes and some salt and pepper. Stir really well to ensure nobody gets a mouthful of unmixed chilli seeds and reduce the heat slightly. Cook, uncovered, for about 40 – 50 minutes, stirring occasionally. The onions are ready when all their juices have evaporated, they are slightly sticky and you can smell the caramelising sugar. They should be so soft that they break when pushed against the side of the pan with a wooden spoon. Note: The recipe says slow cooking is key and not to rush this part. It took about an hour and a quarter for the onions to reach that stage. It might be that a cast-iron pan would have seen a faster result than my Circulon, but the internets say onions always seem to take longer than recipes say. Allow lots of extra time. Pour in the wine, vinegar and port and simmer everything, uncovered, over a high heat, stirring occasionally until the onions are a dark mahogany colour and the liquid has reduced by about two-thirds. When drawing a spoon across the bottom of the pan clears a space which fills rapidly with syrupy juice, it’s done. Note: This bit took about an hour and a half and then very suddenly the liquid reduced a touch further than I’d have wanted. The consistency is still lovely, though, I just maybe didn’t get as much of it as I might have done. Leave the onions to cool in the pan, then scoop into sterilised jars and seal. If you’re new to this sort of thing, here’s a video on how to sterilise glass jars and their metal lids. Filling jars is much easier when you use a wide funnel like this, which you can sterilise in boiling water with the lids. Take jars out one at a time as you need them, and fill them as full as possible. I’d suggest using smaller jars so you can keep them sealed until you need them. Just store in a cool dry place and in the fridge once opened. I’m going to have another crack at the original recipe I tried, because it’ll be much cheaper and, frankly, healthier, than this one. That said, I would quite like to keep a jar of this on hand – I can see it being a useful addition to any number of recipes. I’m considering trying to combine it with cheese scones. There might be some technical reason why that wouldn’t work, but having never studied this sort of thing, I shall find out the entertaining way. Visit SAM2.0's profile on Pinterest.